The sequence representation presented in the preceding chapter can be used to detect clusters of similar neurons which can then be investigated for their stereotypical branching patterns. 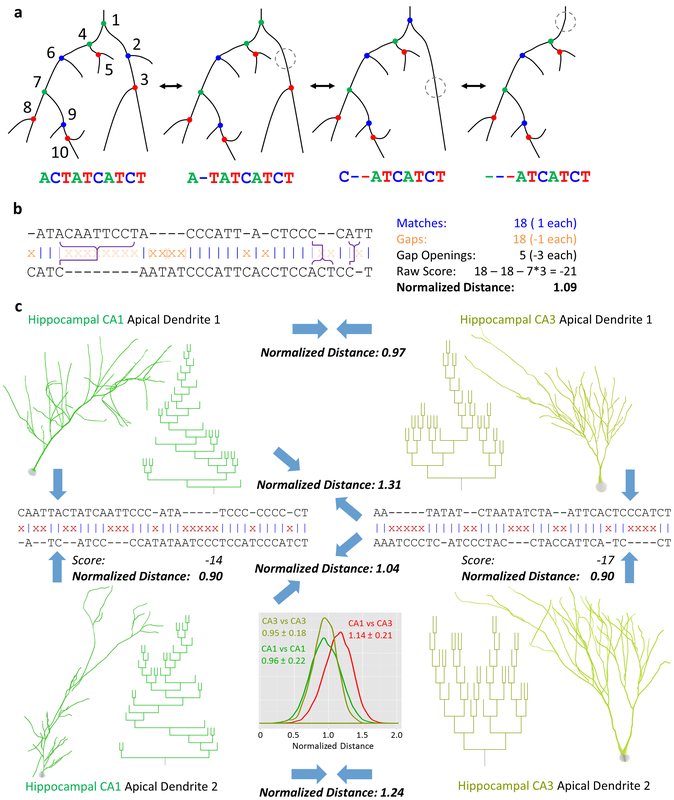 We use a modified sequence alignment procedure to produce pairwise similarity values between two neuronal sequences and then, after embedding the neurites (axons, dendrites, or apical dendrites) into a space consistent with those values, look for clusters in the space. The clusters are then overlayed with known cell classes to see whether significant associations emerge. 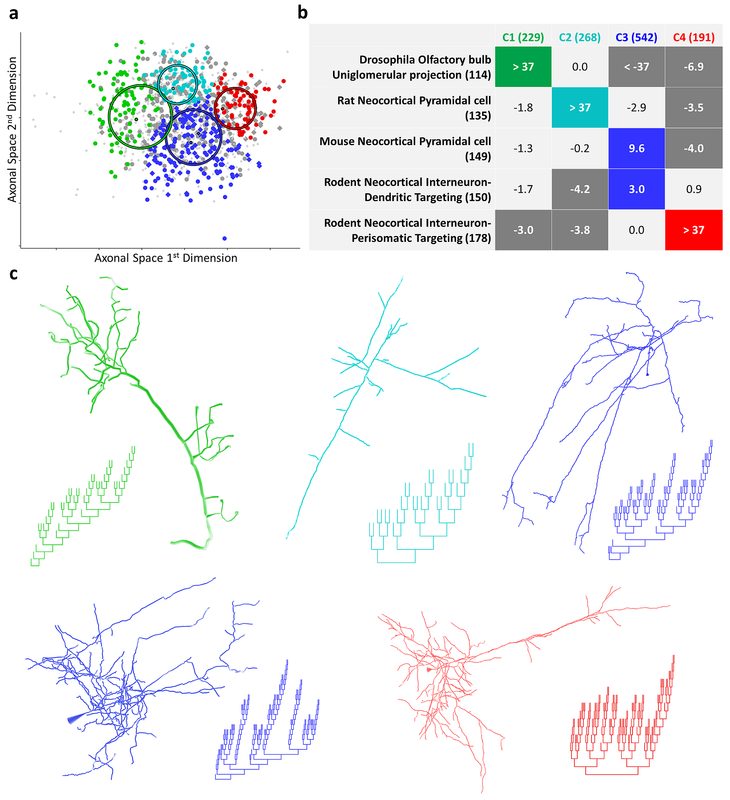 The results indeed show a number of very strong associations by cell type, brain region, and species, indicating that neuronal branching patterns are indicative of neuronal type and thus function. We further explore the particular prototypical structures of each cluster and comment on the drivers of those structures and their significance to function, primarily in terms of connectivity. Three figures from the chapter (and the journal article) are shown below. Growth or retraction of a branch is associated with specific changes in the trees sequence representation. 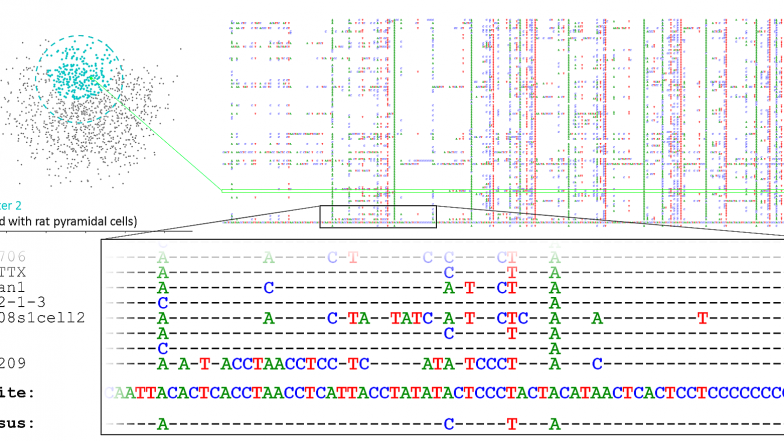 These processes are used to adapt sequence alignment for sequences derived from trees. The space created from alignment scores of axons is clustered into four groups that strongly associated with known neuron types. The table shows the log of the association p-value after Bonferroni correction – absolute values greater than 3 are statistically significant. Positive values show positive association. Examples of the axons and their dendrograms are shown below. The most central neurons of the cluster are all aligned together, producing a consensus representing the shared global features of the cluster. 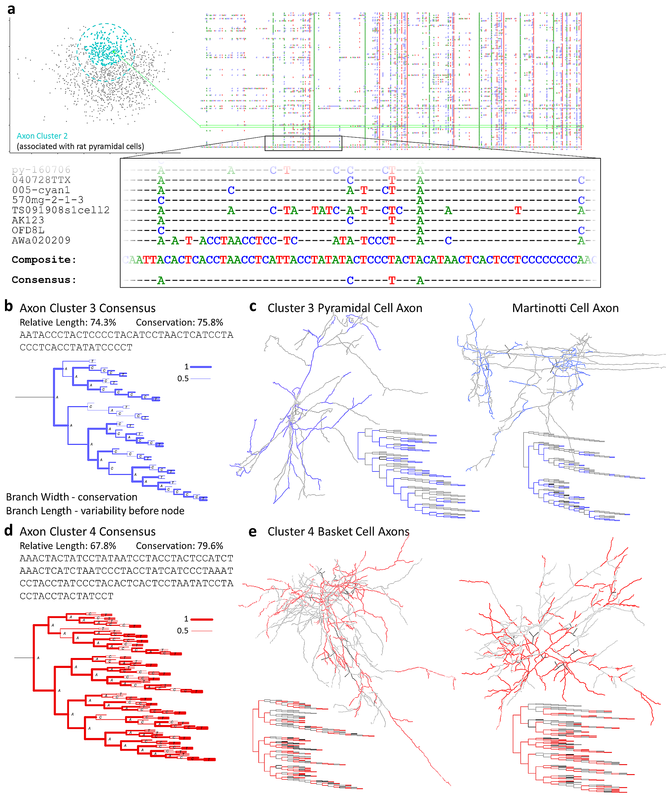 Below are visualizations of the consensuses of two of the clusters along with example neurons colored by their overlap with their cluster’s consensus.